1. How far was that overtime kick by Chandler Catanzaro? Oh, about as from Raymond James Stadium to the Unemployment office. If he misses that kick, on top of another extra point (his third) and the game-winning field goal, the kicking caravan would have started today. With one kick, Catanzaro moved up from "Aguayo" to, say, "Husted." Can he eventually work his way to being a Gramatica? 2. 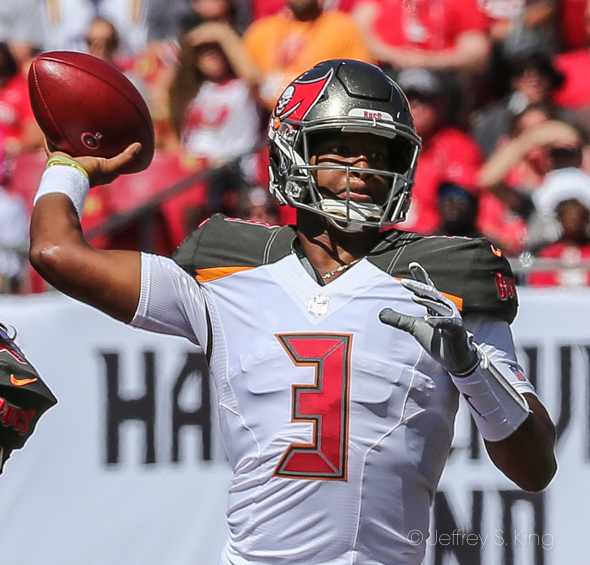 Jameis Winston says he's working on protecting the ball, but how important is it to him? I get that he'll never be a guy who never throws interceptions; part of his game is to try to force the ball into tight windows. But the Bucs simply cannot afford two a game and hope to beat anyone who isn't the Browns. 3. Here's an interesting stat. Carl Nassib has two sacks on the season. Vinny Curry has 1 1/2. 4. 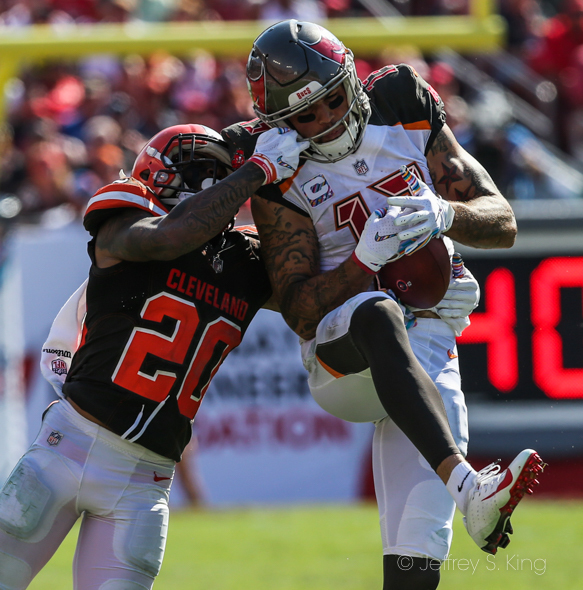 The Bucs are going to miss Kwon Alexander. It matters to the guy. 5. 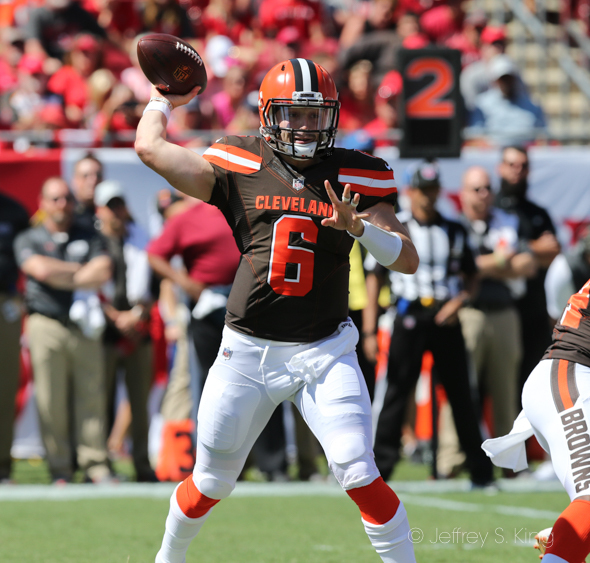 The Bucs' secondary was better, but they still forced just 11 incompletions in 34 passes from Check-Down Mayfield. (On stops in the red zone): “First off, that Lavonte (David) play ... it was somewhat easy to see, but I don’t know if you can appreciate how good of a play that was. When (Baker Mayfield) broke out of there, not only did it look from where I was standing that he was going to get the first down, but like he might score. When you really see it on tape on the end zone shot, the fact that Lavonte tomahawked him and got that ball out and it went out behind, that was a heck of a play by Lavonte. "The second one, we had been switching personnel and I was actually thinking about using a timeout there because we were a little bit out of kilter there when they were trying to go fast. They ran that sneak on fourth down and the one thing about those sneaks nowadays is since they let the running back come up and push, it’s next to impossible to stop it. Again, when you look at the end zone copy of that, we just got a really good charge from our inside guys and our outside linebackers really did a good job of squeezing that down. And then Adarius was one of the guys in the middle of that. We did a good job of not letting them push the pile which is tough to do. That was a huge stop." "That's how far the Browns' receiver-challenged offense has fallen. The first play of the drive was a throwaway to Landry near the 5; and the second was an incompletion to a tightly covered Landry at the right side of the end zone. Landry wanted a pass-interference call on the play and didn't get it. Tight end David Njoku was also open on a post route on that play. 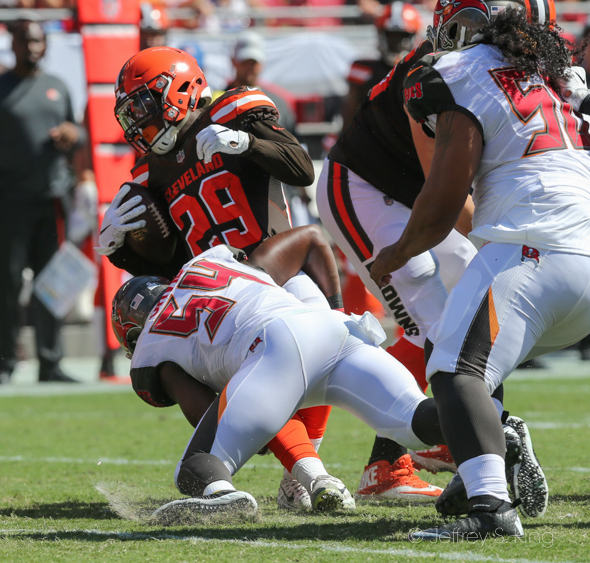 "Damion Ratley caught an 8-yard pass on third down, and then the Browns went for it on fourth and 2, with the disastrous result when Lavonte David stripped Mayfield of the ball." "Listening to Hue Jackson's post-game press conference, you could feel the pressure mounting on the Browns. As I wrote, Jackson is going to insert himself into the game planning for the offense. Will he take play-calling away from Todd Haley? We'll see. Jackson promised the former Pittsburgh offensive coordinator could call plays if he came to the Browns." "The offense took those four turnovers and turned them into just seven points. The offense often looked uncertain. Tampa Bay entered the game having allowed 35 points, the most in the NFL. The Browns were facing the league's worst defense -- and that defense was missing three of its top players." "Mayfield looked overwhelmed. He was sacked twice. He was 10-of-16 passing, but only for 62 yards. Nick Chubb had 24 yards on eight carries. 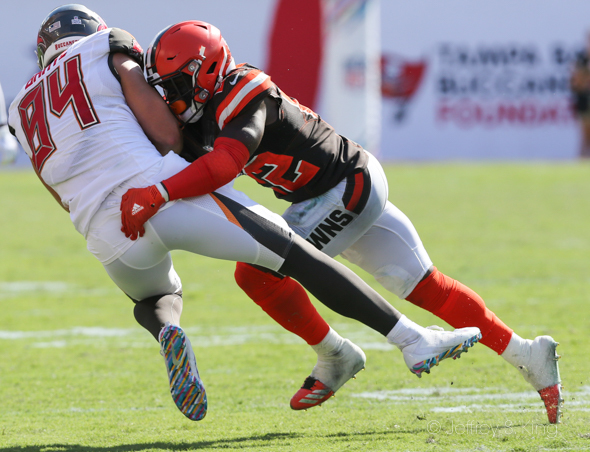 Duke Johnson Jr. carried the ball once for minus-4 yards. The offense was conservative. This is painful to watch." "It’s hard to blame one area for the shortcomings as the Browns just seem like a poorly coached team. They have the most poorly timed penalties, mental lapses, and can’t capitalize on turnovers. "For example, the Browns won the turnover battle in Week 7 four to one. Out of those four turnovers, Cleveland managed just seven points. While that touchdown helped them get back into the game, they could have won if they were able to make more out of the gifts their defense gave them. "This has been an issue all season for them as the defense has been stellar at taking the ball away. As good as they have been in that area, the offense is even worse at doing anything with it." Offense: Bless him or blame him, but at the end of the day, Jameis Winston ends up with most of the Bucs' yardage. Sunday, he led them in passing (365 yards) and in rushing (55 yards). Yes, he remains a turnover machine. But how many players are better on the Bucs' offense. 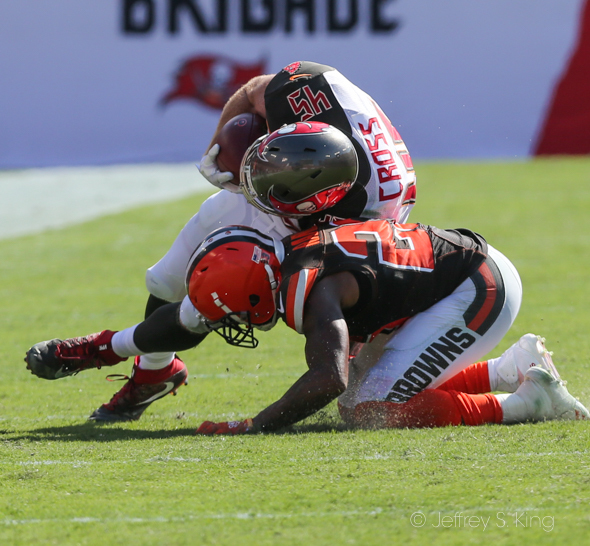 Defense: You could give it to Kwon Alexander, who was inspired before he was hurt. Or to Jason Pierre-Paul, who had another sack. You could argue for Carl Nassib, who had two sacks and broke up a pass. But most of the fuss this week was about the defensive coordinator. Mark Duffner is undefeated. Good stuff, Duff. Special teams: How far away is forgiveness? Is it 40 yards? Is it 50? Is it 55? How about the NFL's longest overtime field goal, 59 yards. You had it all the way, Chandler. Quarterback: Winston taketh and he giveth away. His three turnovers plus the sack he took in overtime could have beaten the Bucs. Against a better team, they should have. But Winston also accounted for 420 total yards. This is par-for-the-course stuff with Winston. Grade: C+. Running backs: Again, I don't see a lot of holes there. 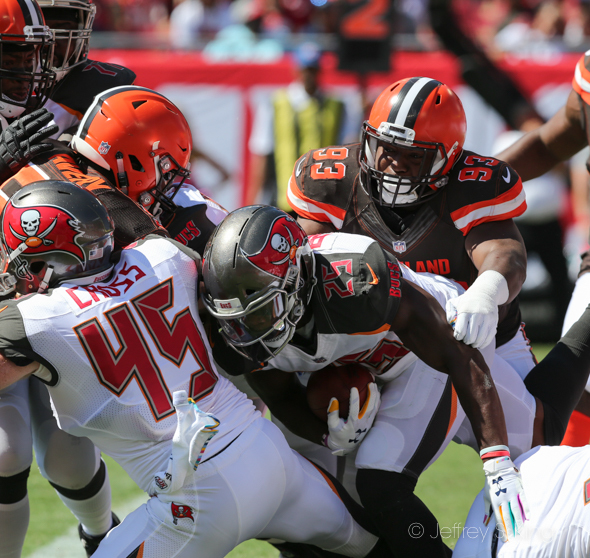 The Browns front seven was a load for the Bucs, whose backs gained only 51 yards on 20 carries. That won't do. Grade: D.
Offensive line: The Bucs didn't run much and they suffered four sacks, two of them in overtime. They gave up a safety. A forgettable game. Grade: D.
Receivers: It remains the biggest strength of the team. 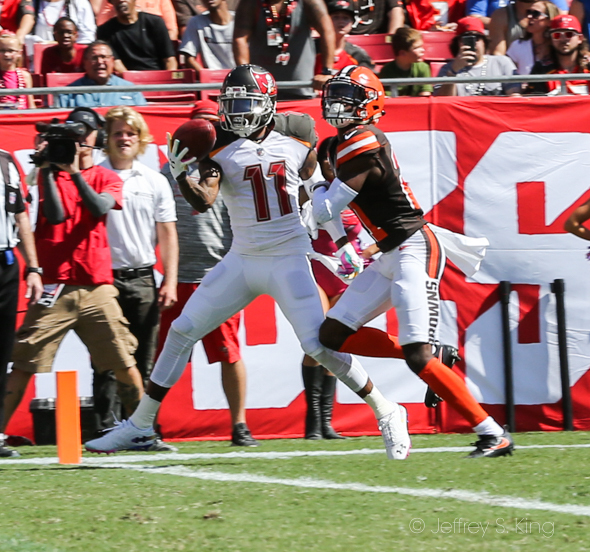 Mike Evans caught seven passes for 107 yards. O.J. Howard is starting to emerge. He had five catches for 67 yards. Grade: A. Defensive line: Look at who has become sack-happy. 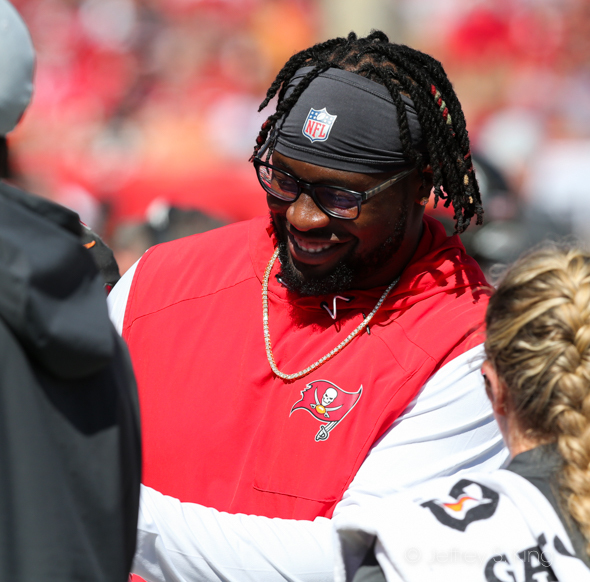 Playing without Gerald McCoy and Vinny Curry, the line had four of the team's five sacks. Grade: B+. may have lost Alexander and Jack Cichy. Grade: A-. Defensive backs: They allowed Baker Mayfield to have a 104.4 rating, but most of his damage was dinks and dunks. For once, the Bucs didn't have embarrassing blown coverages. Grade: C+. 1. 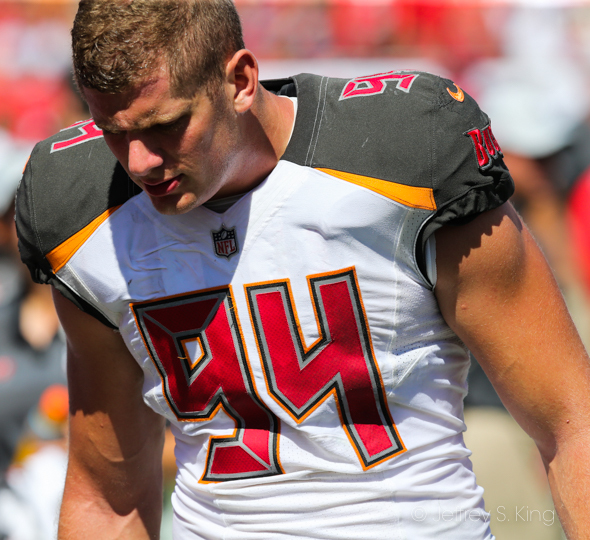 Alan Cross, tight end: Cross has quietly become a good player for the Bucs. His biggest play, however, came late in the third period on fourth-and-one when the Bucs decided to go for it. Cross caught a six-yard pass for the first down. 4. Adarius Taylor, linebacker: Filling in for Kwon Alexander, Taylor had a nice stat line. He made six tackles, had a sack and had one tackle for loss. 5. M.J. Stewart. cornerback: Stewart had five tackles to help the Bucs. 1. Monte Kiffin ... The team's all-time assistant coach. Built a decade worth of excellence. 2. Wayne Fontes ... 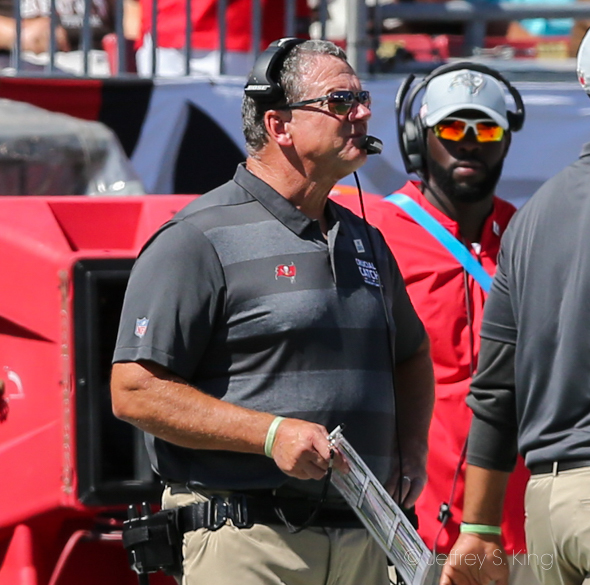 The future Lions' head coach was first with the Bucs. 3. Floyd Peters ... A gravelly voiced, no-nonsense coach. 4. Tom Bass ... Built the Bucs' first great defense. 5. Rusty Tillman ... Tried to help keep Wyche stable. (For Todd Monken, who has been good). 1. Joe Gibbs ... One the Bucs first offensive coordinators. Went on to Hall of Fame career with Washington. 2. Bill Muir (Who sounded a lot like Jon Gruden) ... Oh, Gruden designed the plays and called them. Muir was officially listed as coordinator, though. 3. Monken ... On a lot of teams, Monken would have to put in more than six games. But offense has never been very good around here, and Monk's team leads the NFL in total offense and passing offense. 4. Greg Olson ... Never had enough personnel to allow the Bucs to win. 5. Jimmy Raye ... He was a smart coordinator in a lot of places. 4-15-41 -- The Bucs had to either play for the tie or trust creaky Chandler Catanzaro to kick an impossibly long 59-yarder. They took a shot with Catanzarro, and he squeezed it in inside the right upright for the winner. If the Bucs miss, the Browns have plenty of time and the ball at midfield. 4-1-49 -- The Bucs were at midfield late in the third quarter, and I was sure they were going to punt. You could argue for it, because that would pin down the Browns deep. Instead, the Bucs went for it, and Winston hit Alan Cross for six yards. The Bucs went on to score their last touchdown. 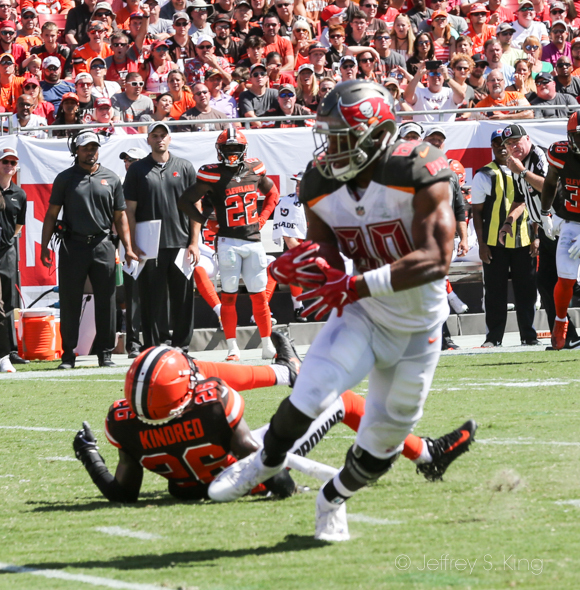 1-goal-14 -- A penalty had just moved the Bucs back 19 yards, but Jameis Winston broke containment and rambled up the middle for the score, diving across the goal line. 1-10-14 -- Winston and DeSean Jackson sometimes don't connect in the passing game. But what's wrong with a handoff? Jackson took the ball and swept around left end for the score. 3-3-38 -- The Browns were close to winning after intercepting a pass from Winston in overtime. But on third own, former Brown Carl Nassib sacked Mayfield for eight yards to stop the threat. 3-8-22 -- Catanzaro pushed a potential game-winning field goal to the right for the miss. 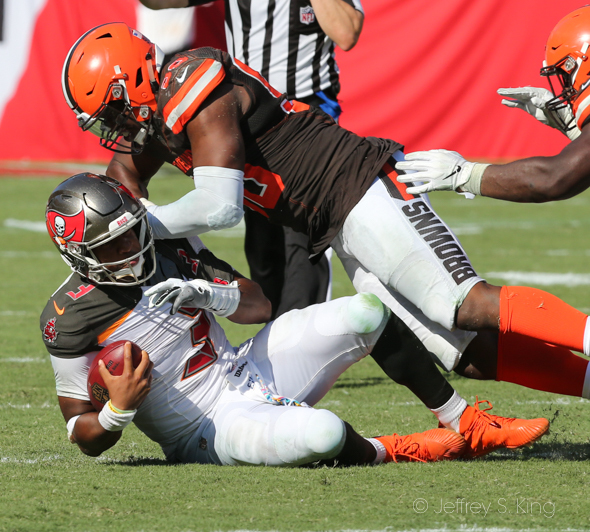 1-10-36 -- The Bucs were in field goal position when Jameis Winston took a 12-yard sack on a play that was different from the one sent in from the bench. It could have cost the team the game. 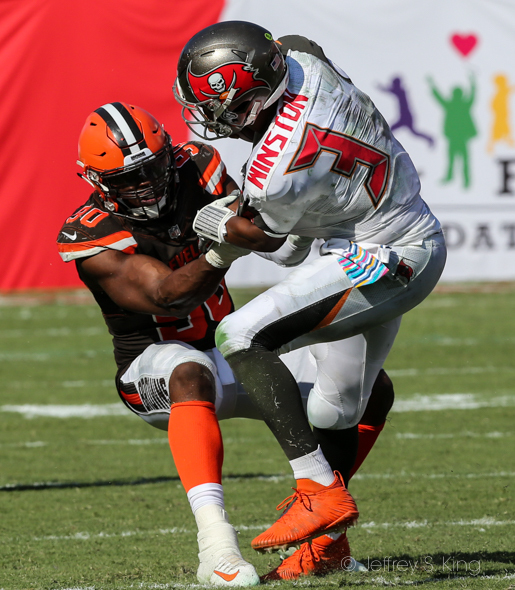 2-16-38 -- In overtime, Winston threw a ball straight to Browns' linebacker Jamie Collins for Winston's second interception of the day. 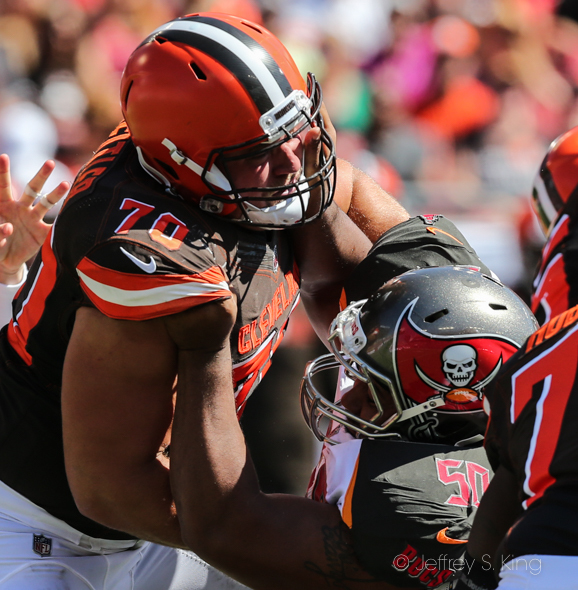 2-10-1 -- The Bucs started badly, with the offensive line caving in twice. On the second one, Payton Barber was tackled for a safety. 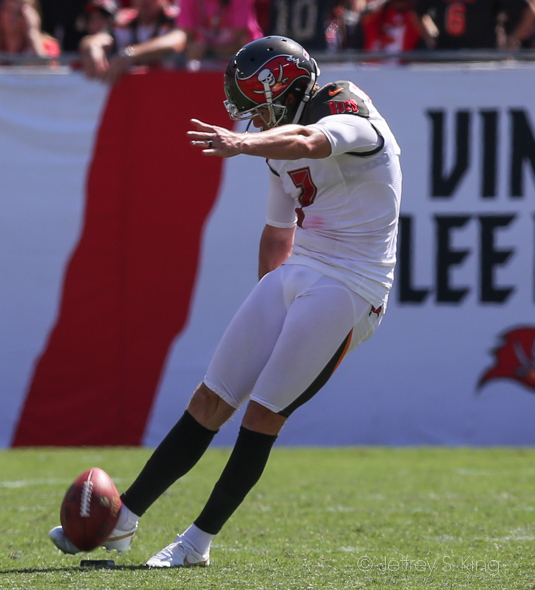 Extra point -- Catanzaro missed his third extra point of the season. If he hadn't, the Browns would have had to go for two to tie it on their last touchdown. Redskins at Bucs: Alex Smith will have a high-completion day, but the Redskins aren't such world-beaters that, at home, the Bucs can't win. Carolina at Bucs: The home field should favor each team. Cam Newton doesn't throw the ball well enough to take advantage of the Bucs' secondary, but that defense is tough. Bucs at Giants: The Giants are 1-5, and noise is surrounding Eli Manning. Who knows who the quarterback will be? 49ers at Bucs: Without Jimmy Garoppolo, the Bucs should win at home. Atlanta at Bucs: The Bucs lost by five in Atlanta. 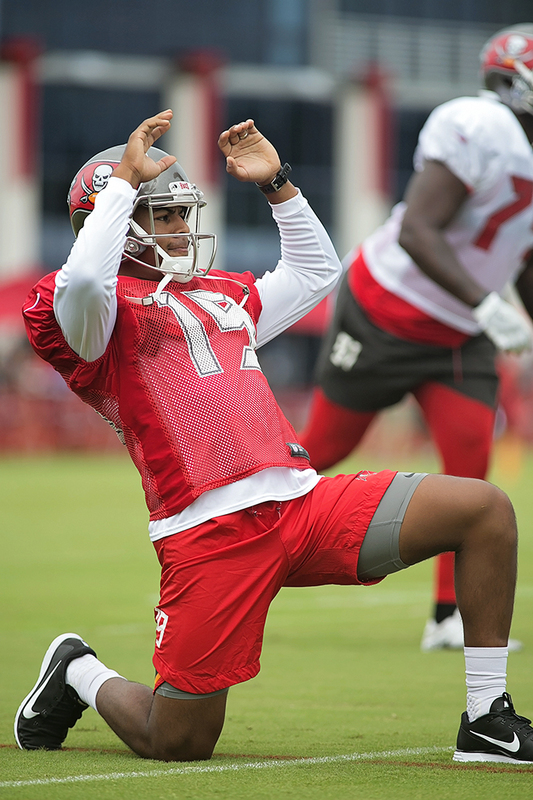 In Tampa Bay, the Bucs should be better. 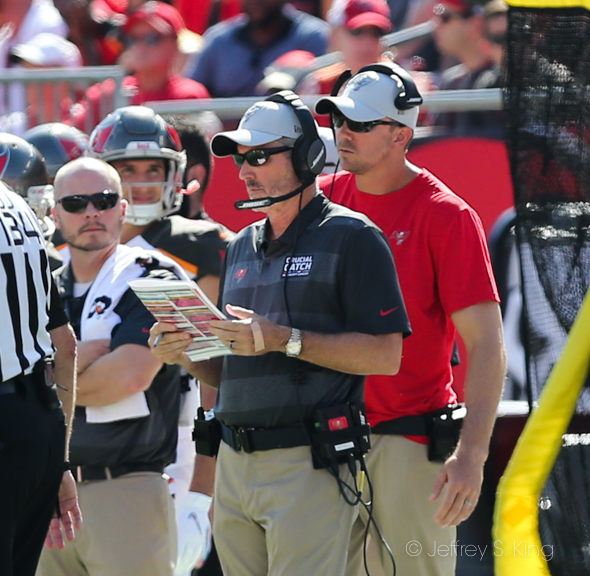 Bucs at Cincinnati: The matchup is wrong for the Bucs. The Bengals have the receivers to get open. Bucs at Carolina: Carolina is tough at home, which could be a little much for the Bucs. Bucs at Dallas: The Bucs don't play well in Dallas. Baltimore at Bucs: The Ravens are simply too solid for the Bucs. 1. 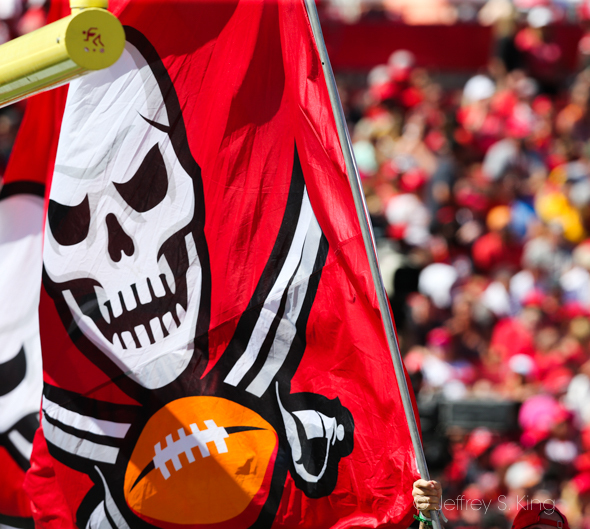 This is the 12th time the Bucs have been 3-3 after six games, and it guarantees nothing. In 1999, the Bucs started 3-3 and finished 11-5. In 1987, they started 3-3 and finished 4-11. After their 11 previous 3-3 starts, they finished with a tad over seven wins. 2. Hue Jackson must have naughty pictures of owner Jimmy Haslam. He has three wins in his last 35 games. Even Leeman Bennett had four wins in two years. 3. 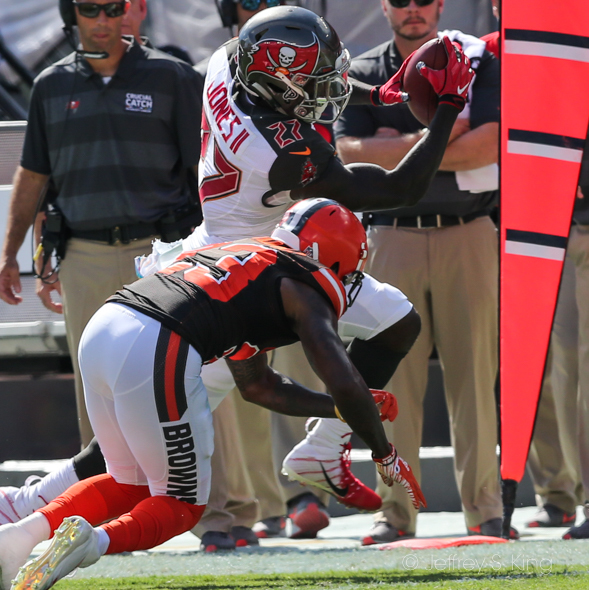 The Bucs called 22 running plays Sunday because, well, there must be some kind of rule that says you should. But the Bucs do the opposition a favor every time they run. 4. If I were Jameis Winston, I might ask myself why I wasn't voted a captain. After all, he's the quarterback. It's his job to analyze things. Is it a dig because he was suspended for a lunkhead move for three games? Is it because of his turnovers? Do some players resent how out front he is? It's never a bad time for reflection, Jameis. 5. Total impact from the Bucs' first two draft picks Sunday: Vea had one tackle. Ronald Jones averaged 2.2 yards per carry. Ouch, and double ouch. This was one (in 2010) that was for the Bucs' Hall of Shamers. Aqib Talib and Sabby Piscatelli had a key interceptions. Josh Freeman threw a touchdown pass to Mike Williams with 1:26 to play. And Connor Barth, the twice-cut kicker of the team, kicked a field goal with one second to play for a 24-21 victory. The Bengals had won 10 games the season before, but the Bucs managed to pull the upset in Riverfront. As it turns out, it was a pivotal game for both teams. The Bucs, who had gone 3-13 the year before, finished 10-6. The Bengals, who were 10-6 in 2009, fell to 4-12.